Worried by a sagging neck or double chin? The first thing many of my patients tell me, is that they want me to ‘do something’ about their neck. And they are not alone. A few google searches show just how much interest there is in the appearance of the lower face and neck. For example, enter the word ‘chin’ into Google, and ‘chin fat’ comes up as the next most searched item. Enter ‘chin fat’ and the next two most popular searches are ‘chin fat removal’ (an incredible 4.3 million search results) and ‘chin fat surgery’ (945,000 results). By contrast, ‘jowl removal’ returns (a comparatively small) 158,000 results while ‘jowl lift without surgery’ gives just under 400,000 results. And in this age of social media and the selfie, Google has 981,000 entries for ‘how to remove a double chin in Photoshop’! When training to be a Dermatologist we were taught to think of the lower face as a triangle. In a young person the triangle is upside down, so the base of the triangle would go from cheek to cheek and the pointy part would be above the chin. This all starts to change when a person is in their mid to late 30’s (yes unfortunately it is that early), and the body really slows down the production of collagen and elastin, which support the connective tissue underneath the skin. At that age the triangle becomes reversed, so that the top or pointy bit, is on the nose and the wide base is across the bottom of the face, where sagging skin makes the lower half of the face appear wider. However something else can happen to the lower face and which as we have seen above, is a concern for many people. Under the chin is another triangular shaped area, called the sub-mental. Sub-mental fat plays an important role in the appearance of a youthful looking neck, but it is also prone to a condition which in medical terms is known as ‘sub-mental fullness’. To a layman sub-mental fullness is called a double chin! 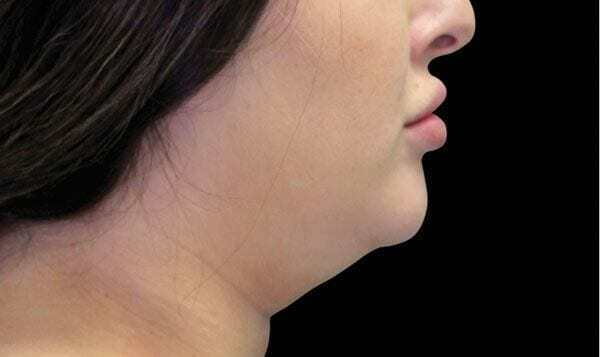 A double chin occurs when there is excess of subcutaneous fat in the sub-mental area. It may be caused by ageing, genetics, hereditary factors (e.g. one or both of your parents had a double chin) or weight gain. Sometimes when people describe themselves as having excessive neck fat, what they are really talking about, is a double chin. Whether someone has loose or sagging skin in their lower face, or a double chin, there are a number of non-surgical options now available and which will offer improvement. The non-surgical options for tightening loose skin in the lower face and neck, include Exilis Elite Radiofrequency Skin Tightening and Ultherapy. Exilis Elite Radiofrequency Skin Tightening is popular because visible improvement can usually be noticed after the first treatment even though a course of treatments are always required in order to obtain long term improvement. Our clinic was recently judged by the manufacturer of this treatment as ‘Overall Winner: Exilis Elite Best Treatment Provider 2017’. Exilis Elite Radionfrequency works by sending a narrow beam of energy deep into the skin to address the early signs of loose or sagging skin. Ultherapy uses focussed ultrasound energy to stimulate the regrowth of collagen and elastin, so as to achieve a lifting effect that is visible on the surface of the skin. Ultherapy is sometimes called a ‘non-surgical facelift’ due to the lifting effect that can be achieved. Ultherapy is excellent for lifting and tightening skin on the jowls and also for achieving a non-surgical neck lift. 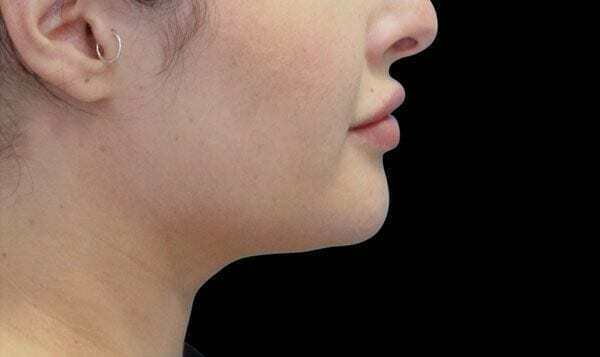 In the photographs below, it is possible to see the improvement that has occurred to the lower cheeks or jowls, as well as the neck following the Ultherapy Treatment. Typically only requires one or two treatments, but the results will take time to achieve. Best results are usually visible after 2 – 6 months. For removing sub-mental fat or the double chin, we recommend CoolSculpting with the CoolMini Applicator, a specially designed applicator that fits neatly on the area underneath the chin. Usually only 1 or a maximum of 2 CoolMini treatments will be required, to remove fat in a double chin with each treatment being less than an hour. CoolMini uses controlled cooling to freeze the fat cells leading to a process known as adiposis, which in effect is the death of the fat cells. The results of CoolSculpting will usually be seen about 2 to 4 months after the treatment and a typical patient should expect to see a reduction in the size of their double chin of between 20-25% after 1 treatment. Six weeks after CoolSculpting Treatment. Photos courtesy of Alicia Green MD. CoolSculpting and Ultherapy are each less than 10 years old but already proving to be extremely popular. As of May 2015, over 4 million CoolSculpting treatments had been carried out worldwide and in May 2017, the number of worldwide Ultherapy treatments carried out, reached 1 million. So if you are seeking a proven treatment for lifting skin in the lower face and neck, or removing a double chin, you can be assured that there are a range of options available and which do not require any surgery, cutting of the skin or injections. Please contact us if you would like know more about the treatment options mentioned here or any other treatments at Dr Haus Dermatology.